The New Media Incubator provides meeting areas, a computer lab and studio space to make it easy for students in the Motion Pictures Program and from the Department of Communication to work together. 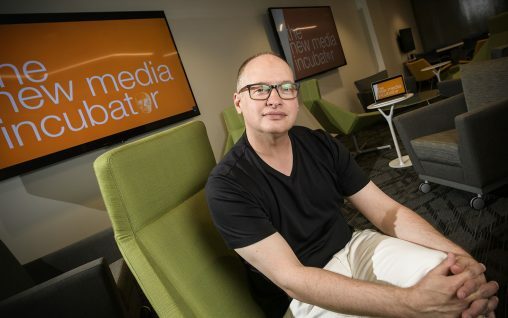 “The New Media Incubator is a collaborative space to support creative practitioners working in the areas of communication, film and storytelling,” said Will Davis, the incubator’s manager and an instructor in the Department of Communication. The Wright State community and the public can check out the New Media Incubator during an open house on Thursday, Sept. 1, from 4 to 6 p.m. The incubator is located at 015 Dunbar Library. “We are excited about the active, collaborative opportunities that the New Media Incubator provides for our students, faculty and community to engage in developing the media of the future,” said Kristin Sobolik, dean of the College of Liberal Arts. The incubator will host classes, including Video Storytelling, Audio Communication, Performance for the Media and others led by faculty from communication and motion pictures. A computer lab is available for digital editing, creating motion graphics and publishing work online. The incubator boasts a working television and film studio with professional cameras. In the neighboring control room, students can manipulate and monitor studio events. It also includes open space where students can get together and talk about their creations. “This is a very active learning space,” Davis said. 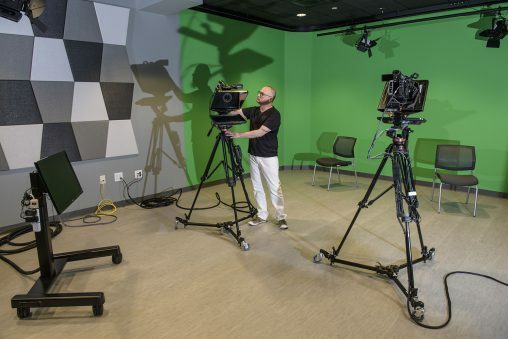 The New Media incubator features a working television and film studio with professional cameras and control room where students can manipulate and monitor studio events. It’s an opportune time to open the New Media Incubator. The disciplines of journalism and storytelling are blurring, and students and professionals in the fields of communication and film often use the same tools to create their works, Davis said. Davis plans to host regular events at the New Media Incubator. “Conversations@theINC” is a series of talks by visiting speakers from the local media. “Happenings@theINC” are special events like workshops, screenings and peer review sessions in which students can share their work and get feedback. He also plans to partner with local businesses and organizations to recruit speakers, request workshops and promote students. At the same time, business can receive specialized training from students in the incubator. “There are opportunities that professionals from local businesses can come here and learn from our amazing students,” Davis said. The incubator also plans to offer a new media camp at the incubator for teenagers next summer. The College of Liberal Arts will celebrate the renovation and modernization of the Creative Arts Center and the opening of the Tom Hanks Center for Motion Pictures throughout the 2016-2017 academic year. Sept. 1: New Media Incubator Open House, 4-6 p.m.
Sept. 8: Stein Galleries Champagne Toast, 4:30-6 p.m.
Sept. 11: Art Season Launch Party, Stein Galleries, 4-8 p.m.
Sept. 22: Opening Night of “Restoration,” Festival Playhouse, 7 p.m.
Oct. 1: Homecoming: Creative Arts Center Open House, 2-4:30 p.m.
Oct. 1: Homecoming: Tom Hanks Center Open House, 2-4:30 p.m.
Oct. 25: College of Liberal Arts Donor Appreciation Reception, Creative Arts Center, 5:45-8 p.m.
Oct. 27: Opening Night of “No, No Nanette,” Festival Playhouse, 7 p.m.
March 31: Design Tech Portfolio Exhibit, Creative Arts Center, 4-7 p.m.
April 20: Dance Concert, Festival Playhouse, 7 p.m.